This post was orignally published on November 10, 2017 and was updated with new information on September 12, 2017. Out of every $1 billion spent on projects, $135M is “at risk” of project failure. And the leading cause of project failure? Poor communication. Communication - or the lack of it - is the cause of one-third of all failed and delayed projects. Without clear and precise communication, you’ll struggle to define goals, set schedules and align your team with the client’s needs. How can you avoid communication breakdowns on your next creative project? What steps can you take to avoid communication mistakes? I’ll share some answers in this blog post. The client communication plan is one of the most important tools in the project manager’s toolkit. This document tells everyone on your team how, where and when to communicate with all involved parties - team members, managers, stakeholders, and sponsors. 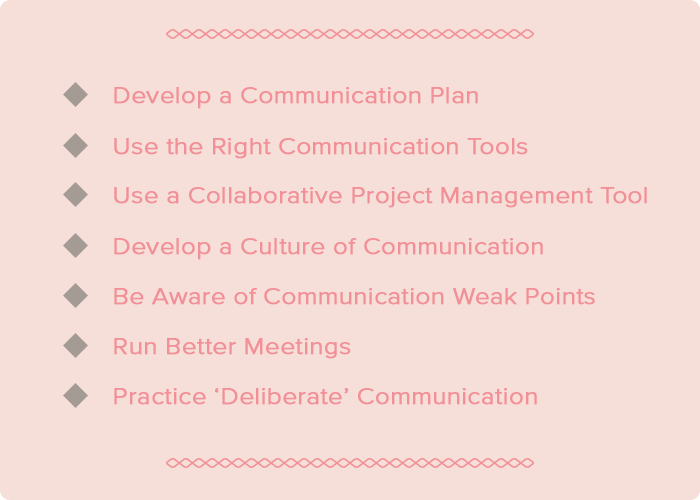 Projects without a detailed communication plan often suffer from haphazard, inconsistent communication. Since there is no guidance on what to include/exclude, stakeholders and team members swing between clueless and overwhelmed - neither of which is ideal. The success of any project depends not only on communicating clearly, but also communicating the right information to the right person. A junior level resource doesn’t need the same information as the VP sponsoring the project. Nor does a stakeholder need to know the nitty-gritty of the project. This is why you need clear reporting relationships. Everyone on your team should know exactly who to contact in a specific situation, and what to communicate with them. A clear hierarchy will solve the problem of oversharing and undersharing. It will also give everyone a clear point of contact in case of any emergency. How organizations communicate is often a cultural issue. If some businesses seem better at communicating than others, it’s usually because the leaders at the top have set a clear precedent for communicating effectively. The lack of clear leadership on communication can - and often does - trickle down to the rest of the workforce. If the leaders are reticent or inconsistent in their communication, it can give the rest of the employees the impression that they can do the same. This happens at the organizational-level as well as the project-level. If project leaders don’t step up to share issues and insights with team members, the rest of the team can pick up the same habits. The result? Communication breakdowns and eventual project failure. In the next section, I’ll share some tips on how you can communicate more effectively. Changing how you communicate is neither easy nor instantaneous. You’ll have to develop thorough plans, then develop a culture that encourages clear communication. The number one thing you can do to avoid communication problems is to develop a clear and precise communication plan.This is one of the first documents you should create for every project, regardless of its size and scope. Develop a template, then customize it for each project. Event-specific communication protocols: List down exactly what to communicate before/after specific events such as weekly stand-up meetings or kick-off meetings. Define deliverables, preferred channels and the target for each event. Stakeholder-specific communication protocols: Keeping stakeholders - on your side as well as the client’s - updated is one of your core responsibilities. Identify stakeholders, then list their communication preferences - what channels they prefer, how often they should be contacted, and what to include in each message. Communication channels and content: Identify what information needs to be communicated regularly (such as daily/weekly updates, bug reports, etc. ), then identify the preferred channels for them. Also identify who these messages should be addressed to. For more details, refer to this article on how to create a client-focused communication plan. While email is still a great go-to communication tool, it is not the only tool at your disposal. There are some messages that are better reserved for phone calls or Skype chats. Use the right channel for the right communication-type and you’ll avoid people getting overwhelmed or missing important information. Phone calls for urgent messages such as emergencies. Skype calls for weekly client updates. Slack chat for internal team communication, issue tracking, data sharing, etc. Emails for important project updates. Take care to match the seriousness of a message-type with the seriousness of the communication tool. For instance, an emergency message is better left on a high priority channel like phone calls. For important messages, it’s also a good idea to use two separate communication channels and ask for confirmation of receipt. This will not only ensure that important messages don’t go missed, but will also give you a paper trail. Collaboration and communication go hand in hand. Organizations that collaborate effectively are also invariably good at communication as well. 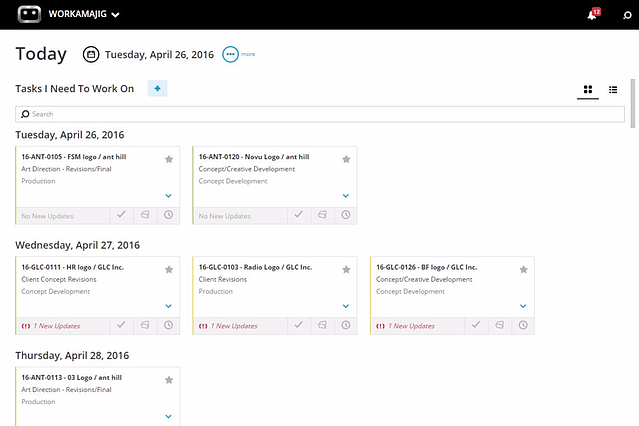 Collaboration-focused project management tools are commonplace now. These tools will give your entire team a single platform to communicate and collaborate on projects. You’ll have all your important project documents, schedules, etc. in a single spot. Start by identifying a good creative industry project management tool and running it through a few projects. The key is to garner a cohesive, collaborative environment that really promotes task ownership among project team members. A project management tool like Workamajig can bring all your communication on a single platform, improving clarity and productivity. Your productivity will increase as your time frees up a bit, your team will be more accountable for their tasks, and project information will be more up to date. More importantly, a centralized platform backed by regular training will help you create a system for communicating and sharing - one that you can reuse across projects and teams. Businesses that do communication well often see it as one of their organizational traits - a part of their corporate DNA. The precedent, as I mentioned above, is usually set early - founders and key executives focus on communication from the very start, guiding others to follow suit. For long-term changes in the way you communicate, commit to developing a culture of communication. If you’re a project manager, you can start from your team. If you’re a business leader, you can do this at an organization-scale. Practice transparency: Share your business strategy, hiring decisions, project direction, and vision in a clear, transparent manner. This will encourage others to practice similar transparency in their communication. Make it a part of onboarding: When bringing in new people, make communication a critical part of the onboarding process. Establish the importance of communication early and you’ll quickly make it a habit for your new hires. Use more convenient communication tools: An easy way to encourage communication is to use a faster and more convenient communication tool. Ditch email for something like Slack where people can jump in/out of conversations in an informal setting. Have a bias for communication when hiring: When hiring, pay close attention to how someone communicates. Do they communicate clearly and transparently? Do their messages have the right style and tone? If you focus on these issues while hiring, you won’t have to worry as much about training them later. Suppose there’s an urgent issue that needs the CEO’s attention. You leave a message with the CEO’s secretary, but the message never gets through because the secretary forgot about it. The issue goes unresolved, derailing the project. This is an example of a communication “weak point”. The best-formed communication plans can go awry due to a single weak point in the communication chain. To be effective, you need to be aware of these weak points and find ways to fix them. Consider it during risk planning and identification. Who and what are the weak points? That VP? The CEO's secretary? The PMO director (yes, it happens)? The project sponsor? Certain key stakeholders? Stakeholders, team members, sponsors, etc. who have reputations as bad communicators. Communication channels with unusually poor response rates on previous projects. Outside contractors who don’t have access to your internal communication tools/protocols. If a stakeholder is often unavailable to make important decisions, you need to know it. If a specialist freelancer is tardy with emails, you need to know it as well. Once you’ve identified these weak points, you can find solutions. If the specialist freelancer doesn’t respond to emails, maybe you can call him instead. If the stakeholder isn’t available, you can ask him to delegate decision-making to someone else. Be aware, and be ready to jump the communication gap, if necessary. Meetings are underused as a communication tool. Not only are they great for bringing people up to speed on key issues, they can also create a friendlier work environment. Always do your best to keep the project team meetings going at a weekly pace. Even if there isn't much to talk about – even light discussion is productive as it keeps team cohesiveness high. The information you garner from these meetings is often priceless and the new ideas and strategies that sometimes get discussed can turn a struggling creative project around quickly. Periodically getting those “extended” team members - high-level management and stakeholders - involved in the down and dirty meetings can serve several purposes. This includes promoting communication, increasing project visibility and increasing client satisfaction and awareness. Never underestimate the value that your creative client gets from seeing or hearing your CEO in attendance during a weekly status meeting with the client. While the team-building aspects of meetings are certainly important, it’s critical that you approach each meeting with a fixed agenda. Establish clearly what you hope to achieve from each meeting. Develop a system to gather insights from each meeting and share them with participants. Follow-up as necessary. This will avoid the dreaded Dilbert-esque meetings that go nowhere and consume everyone’s time. So much of our communication - both inside and outside the workplace - is poorly thought out. There is no “deliberateness” to it; we dash out emails without clearly thinking how the other party will perceive it. Essentially, you’re asking whether a message is necessary, clear, and precise. Such deliberateness will make you much better at communicating. Ensure that your team adopts the same principles and you’ll suddenly find your entire organization communicating more effectively. So many things can go wrong on our projects. Maintaining a high level of accurate communication is one of those things that we do have near absolute control over. With project managers spending nearly 70-80% of their time communicating, getting this part right will show great results in all your projects. What about our readers – what do you do to help ensure there are no big communication breakdowns that can wreck a project? To start with, try using the project communication plan template shared below.